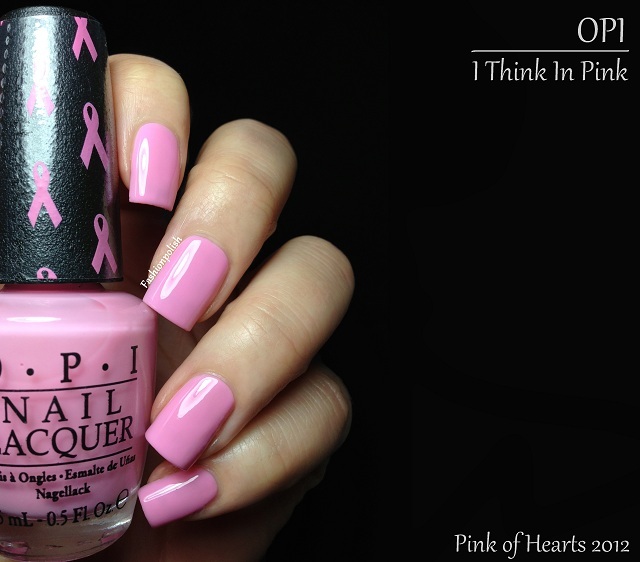 OPI has released this October its 6th annual Breast Cancer Awareness Collection to help raise funds for research and support. 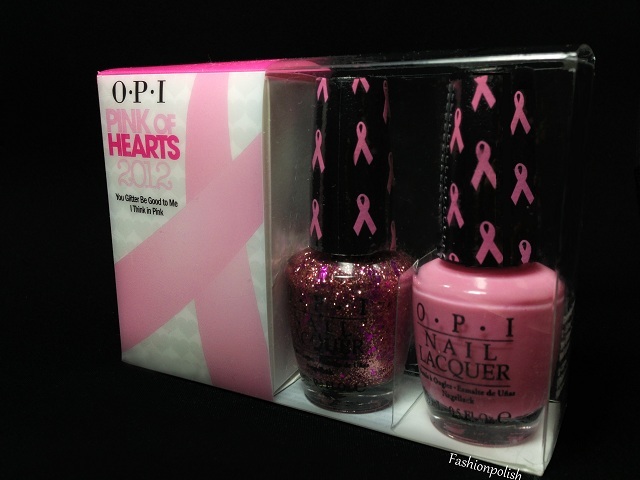 The Pink of Hearts 2012 duo consists of 2 new, exclusive shades : I Think In Pink and You Glitter Be Good To Me packed in a pink ribbon design box. 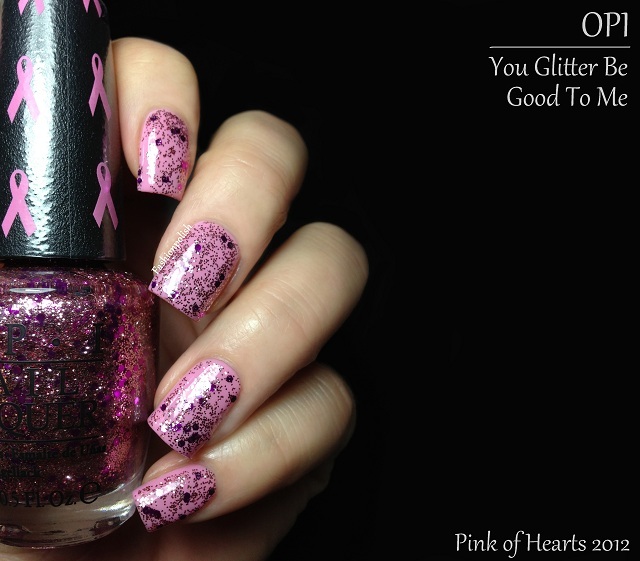 mauve hex glitter and silvery pink glitters in a clear base. One coat over I Think In Pink plus topcoat. A really nice small collection for a great cause! Surprisingly, I absolutely love how soft and delicate I Think In Pink looks on me. You Glitter Be Good To Me would also make a really good layering / sandwiching glitter. Did you buy this set or any of the other BCA realeased this year? Is pink nail polish inside of your comfort zone? Love this combo. It's like a perfect pink. Everything looks good on you. I love soft Pink shades. This is a great combo. I love how the glitter looks on the pink polish. It really transforms it! I did get this, and I agree-it's a very pretty pairing! I looove the glitter; it makes a great sandwich with sheer whites. This IMO is one of the better BCA releases this yr or in recent past yrs. I did pick this one up and I really like the combo together as well as wearing the pink on it's own - it will be a good one to use in nail art as well because the cream formula is great. I was trying to do some tips with the glitter on this one - it's a bit sparse for that but I got it to work finally.I am trying out different shades to use for Dec holiday manis to kind of update the old red, green, silver, gold looks. together are amazing! And your photos are always so beatiful!!! is this a dup for If You Moust You Moust? Here is what i dont understand. This duo is supposedly for Breast cancer awareness. It costs $21 for the set and in sure they are selling like hotcakes and OPI probably made millions of dollars ( or at least hundreds of thousands) yet they are donating only 25,000 to Susan G Komen and breast cancer awareness??!!! $25,000? Thats it? A company the size oc OPI should be ashamed. its like a sham that all of the " breast cancer awareness" items are on sale every october and we buy thinking all of the money would go towards research but it does not.